“I’m so sorry that I’m 45 minutes late — I couldn’t find my car keys!” It’s a classic statement that serves as the perfect excuse for your lack of punctuality. Yet, as good of an excuse as is this for many people, it’s also a genuine reality characterized by doubt, fear, panic, and “I can’t believe I lost my only set of keys” anxiety. It happens to the best of us, but for some, it occurs all too often. Really, how is it so easy to lose something as important as a set of keys? At Sure-Lock Locksmith, we’re in the business of helping people. From Naples to Fort Myers and Marco Island, our team of commercial and residential locksmith professionals has bailed out countless Southwest Florida residents. Though we probably won’t personally come over to your house to help you lift up your couch in hopes of finding your misplaced car keys, our locksmith services are extensive and can help you out in a number of ways. 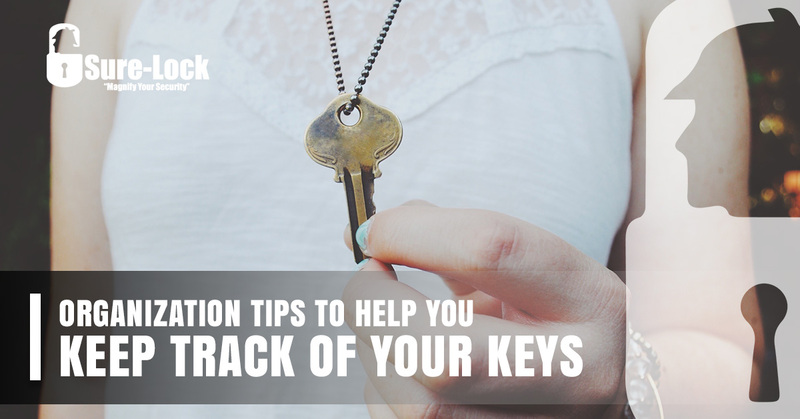 As a helpful reader resource, today’s blog post covers a few handy ways to ensure that you know where your car keys and house keys are at all times. Ultimately, the responsibility to keep track of your eyes is yours, but a few organizational tips and tricks never hurt! The tool that gives you access to your home or vehicle — often a place of comfort, security, and convenience — deserves a place of its own. Muscle memory goes pretty far in humans, and we often tend to repeat the same day-to-day motions without so much as a second thought. In this case, dedicating a specific location or place to hang your keys within your home is a great way to ensure that they’ll always be there when you ready to go. You’re more likely to lose or misplace a key when it’s not bunched together with other keys and small barcode passes like a library card or gym membership. In fact, keeping a car key or house key completely separated from anything else is a surefire way to lose it or have it slip out of your pocket. Even a hefty key ring with a glow-in-the-dark or neon color will help clearly identify your set of keys and make it more difficult to lose them. Don’t throw out the cork the next time you drink a bottle of wine. For our Southwest Florida residents who spend a lot of time near the water (and let’s be real, of course you’re frequently near the ocean! ), a DIY cork keyring is a great way to ensure that your key won’t sink in the event that it falls out of your pocket from a boat or even along the shoreline. We’ll be back with more key organization pointers in the near future. In the meantime, feel free to learn more about our service areas of Naples, Fort Myers, and Marco Island, or directly get in touch with any questions!